Day One - Sunday 7th July 2013 - Chalet des Cascades plus a walk from Lac de Joux Plane to La Bourgeoise. Day Two - Monday 8th July 2013 - Sixt Fer à Cheval plus a walk in the Fer à Cheval towards La Bout du Monde,then in Samoëns. Day Three - Tuesday 9th July 2013 - Morillon to Sixt (Gorges des Tines) along the beautiful Giffre river. Day Four - Wednesday 10th July 2013 - Day Off! Samoëns Market, lazy day, evening BBQ & buffet. Day Five - Thursday 11th July 2013 - Up, up, up walk from Les Allemands to Refuge de Bostan Tornay and down again, 4 hours. Day Six - Friday 12th July 2013 - Verchaix village stroll, Grand Massive Express cable car, and white water rafting. - Extra page - The white water rafting adventure! Extra page - Links to videos on You Tube for Sixt Fer à Cheval, Samoëns, rafting, skiing etc. Photos showing the Chalet des Cascades, with Apartment La Pleureuse, Chalet Henriette, plus the walk from Lac de Joux Plane to La Bourgoise summit, views to Mont Blanc, paragliders, swallowtail butterfly, various wild flowers and a walk in Samoëns. Link to Google Satellite view of the area plus the track of the walk. Gentle stroll from Lac de Joux Plane to La Bourgeoise, 2hrs. Picnic at lake for some followed by lunch and rodeo in Samoëns. 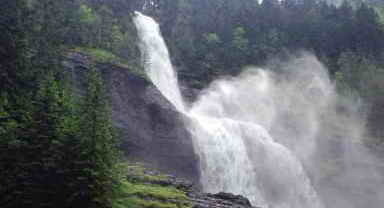 A movie of the Cascade du Rouget. The two visitors' apartments: Nant-Large and La Pleureuse. ST - Chalet Henriette - linked to the Google Maps Streetview of the road, showing the chalet. At the car park, ready for our first stroll. Early morning frost still on the trees, actually, the mountains are not even discernible on the original image and this is somewhat "fiddled", rapidly. IMcC - Chris and Isobel with Mont Blanc behind. JT - Sue with Mont Blanc behind. On the summit of La Bourgeoise, above Samoëns, at 1,770 metres (5,807 feet). Swallowtail butterfly, probably a male judging by the narrowness of the abdomen. The climb up from the town can be seen in this YouTube video, it runs for 5:30 minutes. .
Lac de Joux Plane - and a descent by skateboard (towards Morzine, lasting for 5:41 minutes) - some people like adrenaline "rushes"! A view of Lac de Joux Plane. Zooned view to (believed) Chalets de Joux Plane, where the ski lift terminates. Gentian - there's a few of these, just look down the page! When we got there, it had melted away! Cascades - all through the night!